Availability of the iPad 2 in Apple's online store has remained strong leading up to Wednesday's media event, but on Tuesday the company's U.K. store saw estimated shipping times for one model slip to 1-3 business days. 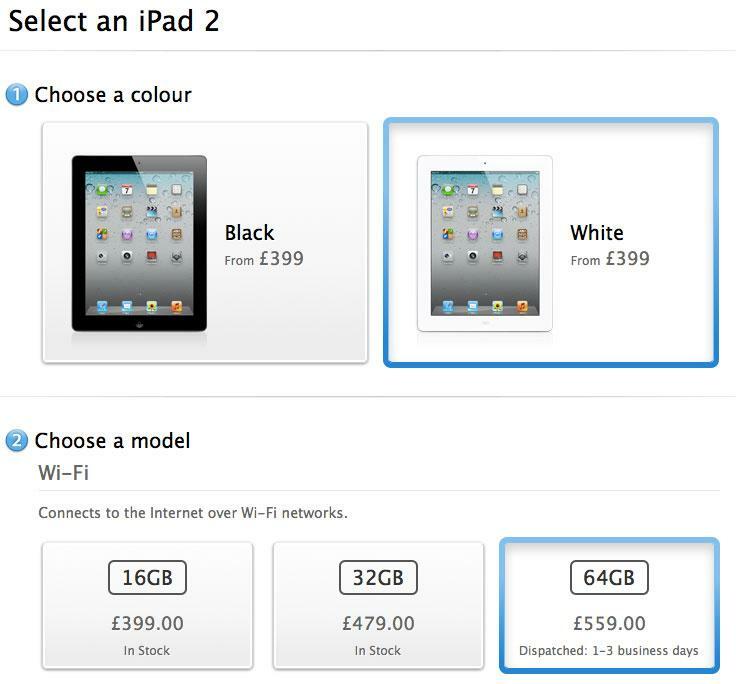 U.K. customers attempting to place an order for the white 64-gigabyte Wi-Fi iPad 2 are now presented with the brief wait time for their order. New iPad 2 orders for all other models, including the black 64-gigabyte version, are all advertised as in stock and expected to ship within 24 hours. The slower turnaround time for one model could be the first public sign of Apple drawing down inventory of its second-generation tablet in anticipation of the new third-generation model. Apple's next iPad is expected to be unveiled at a media event on Wednesday. There have been suggestions that Apple could continue to sell the iPad 2 at a reduced price alongside a new model. But rumors have generally presumed that an entry-level iPad 2 would be a single model available in one capacity, much like how the iPhone 3GS and iPhone 4 are only available in 8 gigabytes, or half that of the least expensive iPhone 4S model. If Apple were to continue selling the iPad 2 at a reduced rate, whether it were to be in a 16-gigabyte capacity or a new 8-gigabyte size, it's unlikely that the company would continue to build and sell higher-capacity models like the 64-gigabyte version now seeing minor shortages in the U.K. While the new wait in shipping times appeared in the U.K. store on Tuesday, there is not yet any sign of an inventory drawdown in Apple's online store in the U.S. There, all models and capacities remain advertised as "in stock." Last year, after the iPad 2 was announced, Apple discounted all models of the first-generation iPad by $100 in an effort to help clear out inventory. Refurbished first-generation models could also be bought for as little as $349.